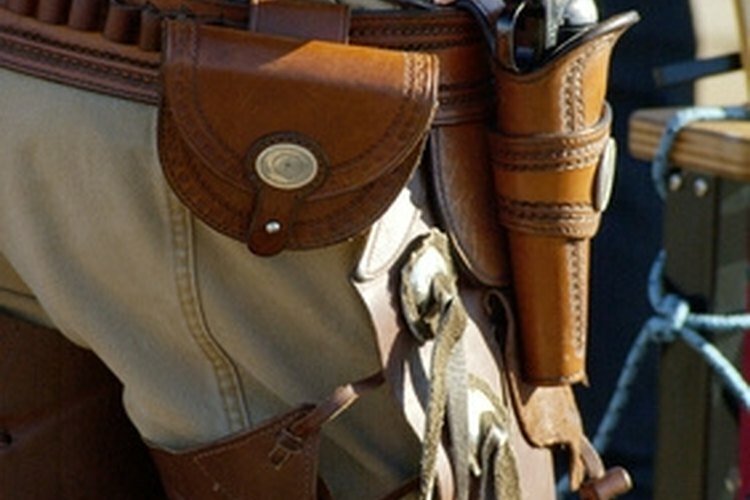 Leather holsters require a breaking in period. Tight-fitting gun holsters are a common problem due to the flexibility of the leather used to make them. This flexibility also makes it simple to block out the holster so that your firearm fits properly. When the leather is new, it is more rigid and requires a period of time for breaking in. Breaking in is the wear and even the oils from your skin that transfers while handling that softens and stretches the leather. Use your holster for a little while to break it in. You still need to block it out. Wrap the gun in a plastic bag slightly larger than the gun. Close the plastic around it so that it is completely wrapped. Slide the gun back into the holster while it's wrapped in the plastic bag. Leave the gun holstered for up to 12 hours before removing it. Unwrap the gun and return it to the holster, checking for an easier fit. Repeat the process if it is still too snug. Remember that you do not want your holster too large. You want the gun to slide in and out easily. Be cautious of using wet substances to stretch the leather, as some may destroy the leather or its components, such as changing its original color or compromising any tooling or other decoration. Frequently Asked Questions: My Holster is Too Tight!